Salsa and integration partner WealthEngine, will introduce the newest ways to get your online donors to take the next step. Understanding your online supporters better can help you build a strong major giving program. Since major giving potential can be informed by factors such as gift history, giving capacity, relationship and affinity indicators it’s important to have all of this information in order to segment and personalize messaging. 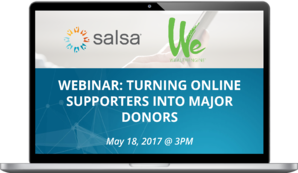 Watch as Salsa Labs and WealthEngine discuss the importance of adding wealth intelligence to your donor profiles within your Salsa CRM, quickly identifying high-capacity online donors, and personalizing the online donation experience. Hear how using the Salsa CRM and WealthEngine integration can help you meet your fundraising goals. How you can immediately learn an online donors giving capacity. How to personalize the online experience for high-potential donors. How to customize your online donation pages to maximize donation amounts.